If you speak to Intel engineers, they’re quite confident of the sixth paradigm, which is three dimensional molecular computing. We live in a three dimensional world, we might as well use the third dimension. It’s very much a mainstream view today. In my last book, The Age of Spiritual Machines, which came out in ’99 that was a controversial notion. But there’s been enough progress on nanotube circuits and other types of molecular circuits, so that it is very much a mainstream view. In fact, there’s a nanotube based circuit due to hit the market next year. These are Hans Moravec’s  computers, these are different computers than are on the previous chart, but it’s the same progression. 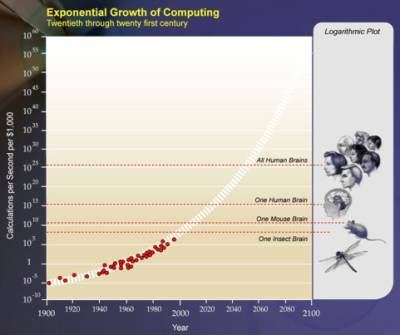 Supercomputers are marching along and will hit ten to the sixteenth, which is the amount of computation required to do functional simulation of all regions of the brain, and I have four different derivations of that. The estimates range from ten to the fourteenth to ten to the sixteenth- I use the latter. And, again, these predictions end up being conservative. Six weeks after the book came out Japan announced two new supercomputer projects to hit that computation level in 2010. 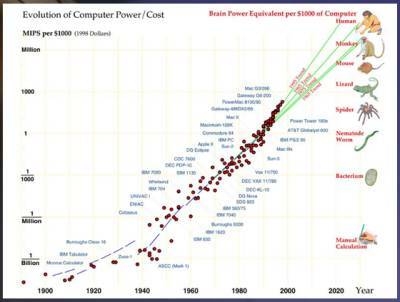 And I don’t want to dwell on these examples of Moore’s law, but look at this chart. 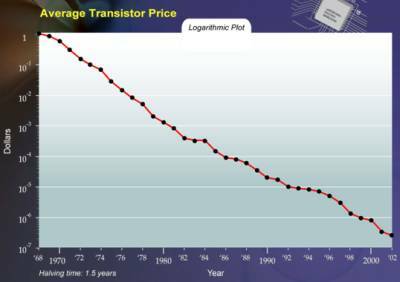 This is the price of a transistor. When I was in high school, I could buy a device this big, a relay with support circuitry, equivalent to one transistor, but one thousand times slower, for forty dollars. And I could buy a whole fast transistor for only one dollar in 1968. We could get ten million in 2002 and get 100 million today. We’ve all heard these very dramatic comparisons, but what I think is interesting, and noteworthy, is how smooth this curve is and how predictable. You think that this would be a very jagged curve. This is the measurement of millions of people’s activity in thousands of companies in dozens of countries, with wars and recessions and IPO’s and accusations of one country dumping products on another. All this unpredictable human behavior and yet you get this very smooth progression: it looks like the outputs of some table top experiment. You might wonder how can that be, if specific projects like Microsoft and Novamente, (well, Novamente, we’re very confident of its success) are unpredictable. How can the overall impact of information technology have such predictable impact? We see other examples. Thermodynamics  was mentioned earlier, where the path of each particle is completely unpredictable, it follows a random walk. In fact that’s built into the derivation of the formulas of thermodynamics. But the overall system of a gas made up of a large number of dynamic, chaotically interacting random particles is very predictable, to a very high degree of precision according to the laws of thermodynamics. You have a large complex system, and thermodynamics is the first one to be introduced in science. The overall impact can be very predictable despite the fact each element is chaotic and random. We can use that principle in building intelligent systems by having and simulating a lot of processes that are simple and chaotic and unpredictable at the levels of each process. They interact in a dynamic system and create a self-organizing process that shows emergent intelligence. That’s how a lot of these pattern recognition systems work, and there’s a system like that in that device there. 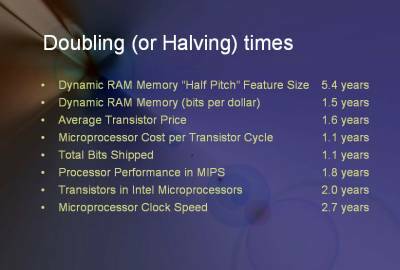 As transistors have gotten smaller, they’ve gotten faster, pretty smoothly. 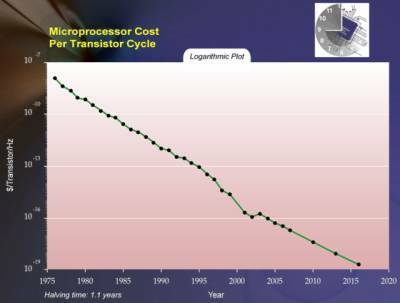 The cost of a transistor cycle has come down by half, every 1.1 years. If you add all the other forms of innovation- pipe lining, data caching, electronics- it brings it down to one year. 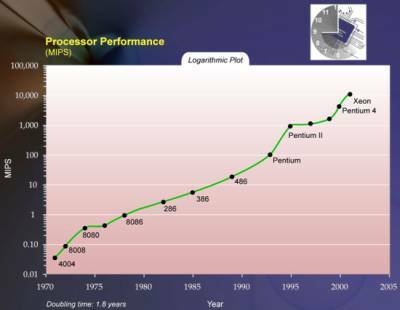 We’re doubling price performance in electronics, every year, going back decades. That’s 50 percent deflation. It turns out that’s also true of lots of other types of information processes, whether you talking about genomic data, proteomic data, brain data, databases of all kinds, all kinds of hardware: 50 percent deflation. The economists, depending on what week it is, will worry about inflation or deflation. Bernanke  and the Fed are back on inflation. They’ll say deflation’s bad too, although nominally it’s a good thing if you buy the same stuff a year later for half the money. They’ll say as information technology ultimately becomes the majority of the economy, which according to my projection it will in the 2020’s, it’s going to lead to shrinking the economy, because people will increase their consumption but they’re not going to really double their consumption every year, year after year. They’ll increase it some, but the overall economy as it has to do with information technology will shrink in dollars and that’s a bad thing. That’s not what we see. We see people more than double their consumption. There’s been 18 percent growth in constant dollars every year for the last 45 years in information technology of every kind despite the fact that you can buy twice as much capability each year for the same amount of money. And the reason for that is as price performance reaches certain capabilities at certain levels whole new applications just explode. People didn’t buy iPods for $10,000 fifteen years ago, which is what it would have cost. People didn’t buy thousand dollar genomes, which is what it will cost pretty soon. As new applications open up, they explode on the horizon and this is the only thing that is growing, that is fueling economic growth. The reason that economic growth is increasing is because more of the economy is shifting to this information economy which has 18 percent growth versus a non-information economy which has negative growth. Magnetic data storage: I just put that up because it has different engineers and different companies but the same expediential progression. We’ve mentioned biotechnology: sequencing costs were $10 per base pair in 1990, it’s a penny today. 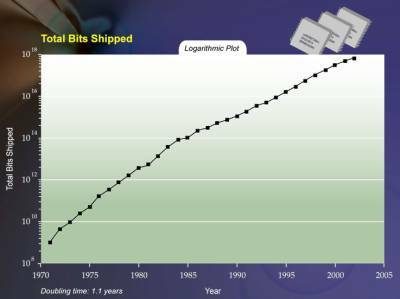 This slope on this log graph represents a doubling of genetic data every year. work on robotics, artificial intelligence, and writings on the impact of technology. Moravec also is a futurist with many of his publications and predictions focusing on transhumanism. Moravec developed techniques in machine vision for determining the region of interest (ROI) in a scene. temperature, pressure, and volume on physical systems at the macroscopic scale by analyzing the collective motion of their particles using statistics. of Governors of the United States Federal Reserve.